If you have one pitcher plant and you’d like more, you may be thinking of growing pitcher plants from seed taken from its spent blooms. Pitcher plant seed sowing is one of the best ways to reproduce the beautiful plant. But like the seeds of other carnivorous plants, they need special treatment to give them their best chance at growing. 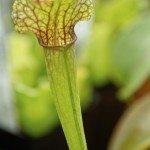 Read on for information about how to grow pitcher plants from seed. If you are growing pitcher plants from seeds, you have to provide them with a lot of humidity to get them to germinate. Experts recommend that pitcher plant growing take place in transparent pots that have lids to keep in the moisture. It is also possible to use regular pots with glass or plastic domes over them to serve the same purpose. Most growers recommend that you use pure peat moss as a growing medium for pitcher plant seeds to be sure that it is sterile and won’t mold. You may also dust the seeds with a fungicide beforehand to control mold. You can mix in a little silica sand, or washed river sand, and perlite if you have some handy. Pitcher plant seed growing requires stratification. This means that the seeds grow best when put in a cold location for several months before they germinate to reproduce the chilly winters of their native lands. Moisten the planting medium first, then sow pitcher plant seeds by placing them on the medium surface. Place the pots in a warm area for a few days, then in the refrigerator for 6 to 8 weeks. After the appropriate amount of stratification time, move the entire pitcher plant seed growing operation to a warmer area with bright light. If you are growing pitcher plants from seeds, you have to be patient. Allow the pitcher plant seeds all the time they need to germinate. Germination for carnivorous plants like the pitcher takes far longer than germination of flowers or garden vegetables. They rarely germinate within a few weeks. Many times they take months to start sprouting. Keep the soil moist and the plant in bright light, then try to forget about the seeds until you see the pitcher plant seed growing.